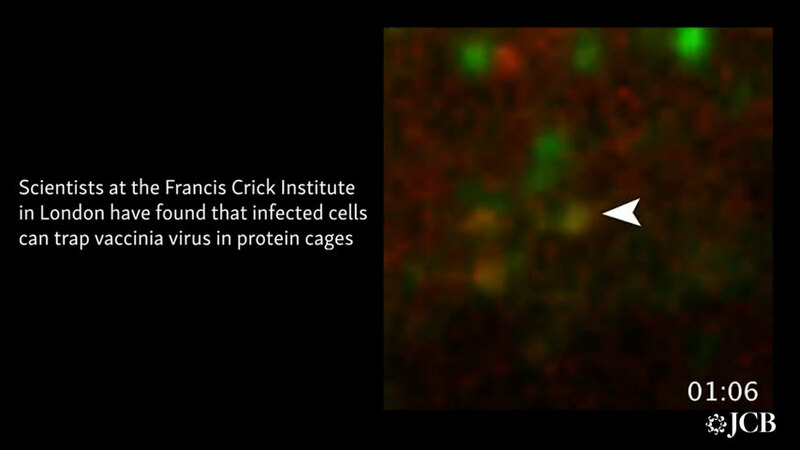 Researchers at The Francis Crick Institute in London have discovered that cells can trap viruses in a protein cage to stop them from spreading to neighboring cells. 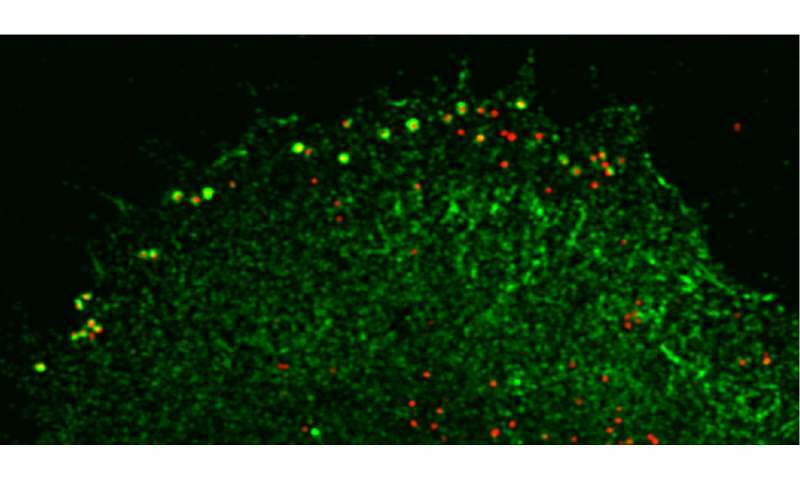 The study, which will be published June 19 in the Journal of Cell Biology, reveals that the vaccinia virus can escape this trap by recruiting additional proteins to dismantle the cage and propel the virus out of the cell. The vaccinia virus usually causes only mild symptoms in healthy adults and, because it is closely related to the smallpox virus, it is a key component of anti-smallpox vaccines. During vaccinia infections, the virus replicates in the cytoplasm of a host cell and then moves along the microtubule cytoskeleton to the plasma membrane, from where it can be released into the surrounding environment. Some of the viral particles remain attached to the plasma membrane and cause the cell's actin cytoskeleton to assemble into "tails" that help the viruses move directly into adjacent cells. Septins are a family of cytoskeletal proteins that control a variety of cellular processes by assembling into filaments and ring-shaped structures. 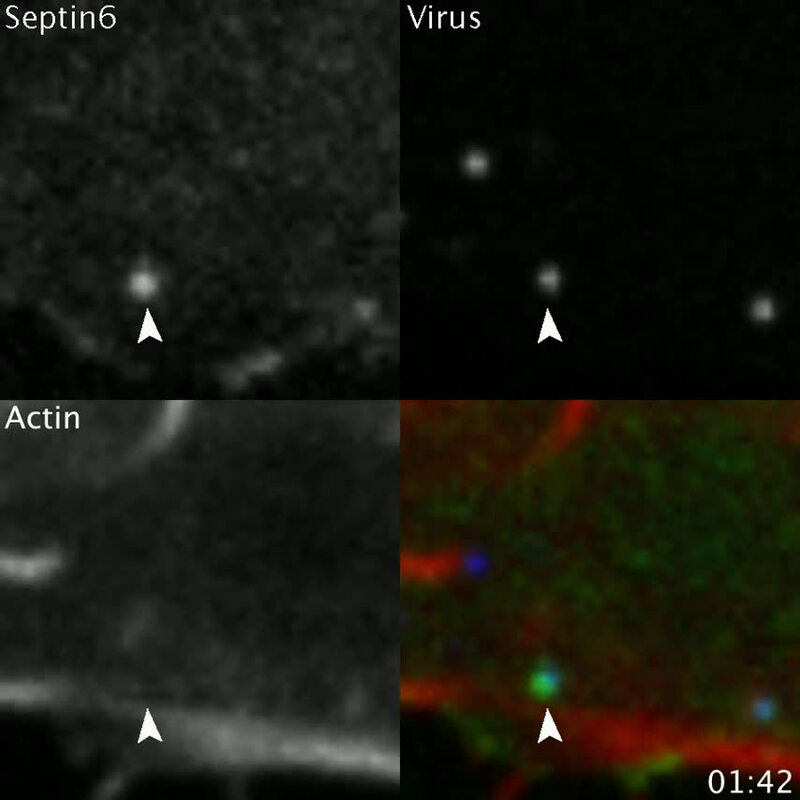 In contrast to microtubules and actin, septins appear to suppress vaccinia infections, although which stage of the virus' life cycle they affect is unknown. "We have now found that septins exert their antiviral effect by forming cage-like structures around viral particles to suppress the release of vaccinia virus from infected cells," explains Michael Way, a group leader at The Francis Crick Institute, who performed the work in conjunction with Julia Pfanzelter, also from The Francis Crick Institute, and Serge Mostowy from Imperial College London. Way and colleagues found that septins assemble around newly formed vaccinia particles soon after they arrive at the plasma membrane. This septin cage inhibits the virus' release and delays the assembly of the actin tail that can help the virus spread to neighboring cells. The researchers discovered that the vaccinia virus can break out of this trap by recruiting several other host cell proteins. These host factors include a protein called dynamin that, working with actin assembly proteins known as formins, displaces the septin cage by inducing the formation of an actin tail. Inhibiting dynamin or formins prevented vaccinia virus particles from escaping the septin cage. Septins have previously been shown to form inhibitory cages around bacterial pathogens such as Shigella. "Our study represents the first example where septins play an important, inhibitory role during virus spread," says Way. "It will be interesting to see whether septins also suppress the release of other viruses, such as herpes virus, when they fuse with the plasma membrane."